When it comes to theater, nuns are fun to watch. Virtually every time we see them on stage, they are doing something outrageous and outrageously funny. 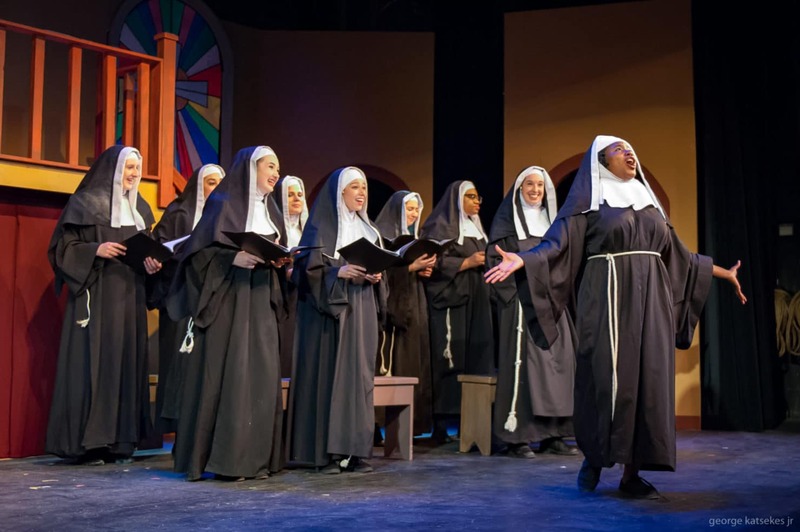 In ‘Sister Act” at the Sunset Playhouse the nuns are more fun than a barrel of church chimes as they depart from their usual habits, dancing and singing in 70s style, from disco to hand jive. Perhaps next to “Mama Mia” this is my favorite musical for sheer joy and enjoyment. When that gaggle of nuns starts swaying their arms and lifting their voices heartily you’d have to be Ebenezer Scrooge not to smile. And there was a lot of smiling going on at Sunset’s version of the show, set in 1977-78 Philadelphia. The show opens with our protagonist, Deloris Van Cartier (Ashley Levells), performing at a nightclub owned by her gangster boyfriend, Curtis (Nick Zuiker). Deloris sees Curtis, who has connections to a record producer, as her ticket to stardom, which she craves. But when she catches Curtis in the middle of a murder, she panics and runs to the police station, where she meets a cop and former classmate, Eddie (Ernest Bell). Eddie believes that Curtis and his gang, including nephew T.J. (Greg Malcolm), Joey (James Ramos) and Pablo (Manuel Lupian), are out to kill Deloris and arranges for her to hide out in a convent while the police try to track the killer down. Mother Superior (Sharon Sprague) reluctantly agrees, but soon finds that Deloris’ lifestyle is hardly a good fit for the convent. Deloris – who is introduced to the nuns as Sister Mary Clarence – takes over musical direction for the lackluster nun choir and turns them into a singing sensation patterned after her nightclub act. Mother Superior is dismayed at the influence Deloris has on the sisters as she sings, “I’ve got celibate nuns shaking their buns.” But when Monsignor O’Hara (Mark Batory) sees the church filled with people and donations needed to maintain the church pouring in, she has no choice but to let Deloris stay, much to the delight of the other sisters who have grown fond of her. Director Diana Alioto has this cast performing at a high-octane level, but none higher than Levells, whose Deloris delivers attitude in every song and move. She has all the star quality her character possesses. Levells loves the spotlight – as her character does – and vice versa. Every line is pure Deloris, as is every look, such as the look of smugness she wears when the monsignor tells the doubting Mother Superior of Deloris’ value to the convent. She can drip with sarcasm on a line like “Ain’t this my lucky day – I got a man who wants to kill me and a cop with a gun. Goody. Goody.” Or, really ham up a sequence, like the Lord’s Prayer she ad libs to the nuns, her version containing fragments of famous non-religious speeches instead of the usual text. Sprague’s Mother Superior is the perfect counterpoint to Levell’s Deloris. Sprague has an appropriate no-nonsense attitude in her scenes with Deloris and really shines with pitch perfect vocals on songs like “Here Within These Walls” and a wonderfully nuanced “Haven’t Got a Prayer,” in which she prays for a sign from God to know what to do about Deloris. One of the most popular tunes of the evening was Bell’s “I Could Be That Guy,” wherein his Eddie character muses about what it would take for him to win Deloris. Bell displays a range as wide as a Nebraska prairie and a romantic, soulful, Barry White style. Adding to the scene’s appeal is the nifty outfit transformation Eddie undergoes with a little help from several other performers. It is a beautifully delivered piece and well-executed scene. Another audience pleaser was “Lady in the Long Black Dress,” in which Curtis’ three henchmen, played by Malcolm, Ramos and Lupian, describe in song and dance how they’re going to woo the nuns. It’s a cute bit that the three execute admirably. The trio’s crowd-pleasing antics balanced out some uneven vocals. But the stars of the show are the nuns. Vocally this ensemble had a nice full sound on opening night, and really excelled in performing Nancy Visintainer-Armstrong’s choreography with precision and energy. It is just a hoot watching a dozen or so nuns do a hand jive! The Act 1 and Act 2 endings were especially joyous celebrations, sending audience members out to the lobby and out into the parking lot with smiles.